Environment Day Greetings to all..
World Environment Day (WED) is created to promote environmental issues to become active agents of sustainable and equitable development. It promotes an understanding that communities are pivotal to changing attitudes towards environmental issues and advocates partnership that will ensure all nations and peoples enjoy a safer and more prosperous future. WED embodies this approach, raising awareness, encouraging people to voice their thoughts and do their utmost to improve the environment. WED falls each year on 5th of June. 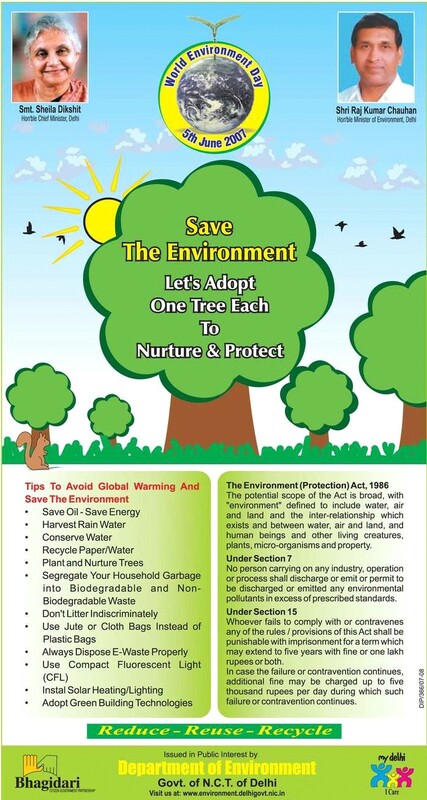 By resolution 2994 (XXVII) of December 15, 1972, the General Assembly of United Nations designated June 5 as World Environment Day, to deepen public awareness of the need to preserve and enhance the environment. That date was chosen because it was the opening day of the United Nations Conference on the Human Environment (Stockholm, 1972), which led to the establishment of the United Nations Environment Programme (UNEP). World Environment Day is celebrated in many ways, including street rallies, bicycles parades, green concerts, essay and poster competitions in schools, tree planting, recycling efforts, clean-up campaigns and much more. In many countries, this annual event is used to enhance political attention and action. However, the event remains most popular among school children who celebrate it with a lot of zest. This World Environment Day, we in Delhi can contribute our bit simply by keeping ourself updated and staying informed of all the so called ‘developmental’ activities in and around the city. Most of these activities are coming at a greater environmental harm even directed at changing the ambience of Delhi. The worst of such activities need to be pointed to the Government and it must be ensured that whatever development happens is necessarily on the lines of sustainable development and not based on some short term goals. 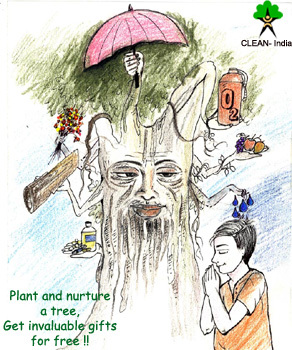 With this note, DelhiGreens wishes everyone a very Happy and Green Environment Day, 2007. PrevEnvironment Day, 2007: Events in the City! hi its too much useful for our india,……………..
”A STICH IN TIME SAVES NINE.” LET’S WAKEUP, TO SAVE OUR BLUE PLANET. SAVE THE PRESENT BEFORE IT BECOMES THE PAST…………. WANT TO SEE A SPECIES WHICH IS SOON GOING TO BE EXTINCT…LOOK INTO THE MIRROR.